You might think that's a silly question, but in the world of academia, revisionist history and even biblical archaeology, scholars have cast the shadow of doubt over Judaism's intrinsic connection to Jerusalem. The Moslem Waqf, the religious authority that administers the Temple Mount -- the site of Judaism's First and Second Temples -- has been claiming for years that there was never a temple there. But the idea that Israel is the historic homeland of the Jewish people and Jerusalem its holy capital has been under attack from far more reputable sources in recent decades as well. For a growing number of academics and intellectuals, King David and his united kingdom of Judah and Israel, which has served for 3,000 years as an integral symbol of the Jewish nation, is simply a piece of fiction. The biblical account of history has been dismissed as unreliable by a cadre of scholars, some of whom have an overtly political agenda, arguing that the traditional account was resurrected by the Zionists to justify dispossessing Palestinian Arabs. The most outspoken of these is Keith Whitelam of the Copenhagen School which promotes an agenda of "biblical minimalism," whose best-known work is The Invention of Ancient Israel: The Silencing of Palestinian History. Finkelstein claims that the myth of King David was the creation of a cult of priests trying to create for themselves a glorious history. Even in Israel, this new school has found its voice. Israel Finkelstein, chairman of Tel Aviv University's Department of Archaeology, began championing a theory several years ago that the biblical accounts of Jerusalem as the seat of a powerful, unified monarchy under the rule of David and Solomon are essentially false. The scientific methods for his assumptions, called a "lower dating" which essentially pushes archaeological evidence into a later century and thus erases all evidence of a Davidic monarchy, were laughed off by traditional archaeologists. But his book, The Bible Unearthed, wound up on the New York Times' best-seller list and he became the darling of a sympathetic media. He concluded that David and Solomon, if they existed at all, were merely "hill-country chieftains" and Jerusalem a poor, small tribal village. He claims that the myth of King David was the creation of a cult of priests trying to create for themselves a glorious history. But the debunkers of Jewish biblical history got some bad news recently, when a spunky, dedicated archaeologist began her latest dig. Dr. Eilat Mazar, world authority on Jerusalem's past, has taken King David out of the pages of the Bible and put him back into living history. Mazar's latest excavation in the City of David, in the southern shadow of the Temple Mount, has shaken up the archaeological world. For lying undisturbed for over 3,000 years is a massive building which Mazar believes is King David's palace. For Mazar, 48, one of the world's leading authorities on the archaeology of ancient Jerusalem and head archaeologist of the Shalem Center Institute of Archaeology, the discovery was the culmination of years of effort and solid speculation. From the time she was a teenager, she had her nose in archaeology literature, and worked closely with her grandfather, renowned archaeologist Benjamin Mazar, who conducted the southern wall excavations next to the Western Wall. She holds a doctorate in archaeology from Hebrew University, is author of The Complete Guide to the Temple Mount Excavations, and in the 1970s and '80s worked on the digs supervised by Yigal Shilo in the City of David. The significant discoveries made then, including a huge wall called the "stepped-stone structure" -- which Shilo believed was a retaining wall for David's royal palace or part of the Jebusite fortress he conquered -- ignited Mazar to continue to look for the prize: David's palace itself. Some biblical scholars gave up looking for the palace because, according to Mazar, they were looking in the wrong place. Scholars searched for remains of the palace within the walls of the ancient Jebusite city that David conquered and called Ir David (City of David). This city, while heavily fortified with both natural and man-made boundaries, was also very small, just nine acres in size. When no evidence of such a majestic palace as the Bible describes was found there, the next step was to claim that David's monarchy never really existed. But Mazar always suspected that the palace was outside the original city, and cites the Bible to prove it. When the Philistines heard that David had been anointed, they went on the attack to apprehend him. This occurred after he conquered the Fortress of Zion, which was the actual nucleus of the city, and built his palace. The Bible says that David heard about it and "descended to the fortress," (2-Samuel 5:17), implying that he went down from his palace, which was higher up on the mountain than the citadel/city. Mazar told Aish.com: "I always asked myself: Down from where? It must have been from his palace on top of the hill, outside the original Jebusite city." Mazar says she was confident in her assessment of where the palace would be. What she discovered was a section of massive wall running about 100 feet from west to east along the length of the excavation (underneath what until this summer was the Ir David Visitors Center), and ending with a right-angle corner that turns south and implies a very large building. Within the dirt fill between the stones were found pottery shards dating to the 11th century BCE, the time when David established his monarchy. Based on biblical text and historic evidence, Mazar assumed that David would have built his palace outside the walls of the fortified but cramped Jebusite city which existed up to 2,000 years before; and in fact, the structure is built on the summit of the mountain, directly on bedrock along the city's northern edge, with no archaeological layers beneath it -- a sign that the structure constituted a new, northward expansion of the city's northern limit. "I was shocked at how easy it was to uncover it, and how well-preserved it was, as if it were just waiting 3,000 years for us to find it." What most amazed Mazar was how close the building is to the surface -- just one to two meters underground. "The cynics kept saying, 'there will be so many layers, so many remnants of other cultures, it's not worth digging, it's too far down.' I was shocked at how easy it was to uncover it, and how well-preserved it was, as if it were just waiting 3,000 years for us to find it," Mazar said. Mazar snickers at the idea that she is some sort of divine emissary revealing the eternity of David's kingdom. "I am a scientist, not a philosopher. My focus is on how magnificent and enduring these complex structures are, that they were preserved and protected for so many generations. In truth, when I began to excavate, I had to be prepared for any result. I even had to be prepared to accept Finkelstein's hypothesis if that's what the facts indicated. Still, I am a Jew and an Israeli, and I feel great joy when the details on the ground match the descriptions in the Bible. Today it's become fashionable to say there was no David, no Solomon, no Temple, no prophets. But suddenly the facts on the ground are speaking, and those outspoken voices are stammering." The City of David is essentially the ancient nucleus of Jerusalem, located just south of the mountain on which the Holy Temples stood. From here the rest of the city as we know it grew and developed over the course of history. According to tradition, the first significant event that occurred there was the meeting between Abraham and Malki-tzedek, King of Shalem. King David, divinely directed, chose this city as the capital of his united kingdom. And the more archaeologists uncover and identify, the easier it is becoming to form a complete picture of the people who lived there -- with the pivotal Jewish history of the First Temple period, described in the Prophets, played out in its structures and installations. The Bible says that King David brought God's Tabernacle to its final home in this original Jerusalem, expanded the city, and made it the spiritual and economic capital of the world at that time. According to Jewish tradition, he fulfilled God's master plan for a spiritual monarchy that would endure until the final Redemption. "The construction that we found was a complicated and intricate engineering operation that must have required immense resources, and the dating matches," says Mazar. "This is the kind of step one would expect of a new ruler who wants to turn the city he conquered into his permanent residence, and who has an exceptional vision of the future development of the city." According to the Bible, David's palace was constructed by Hiram, King of Tyre, the contemporary Phoenician ruler and his ally against the Philistines. Mazar, an expert in Phoenician construction from her excavations at Achziv on Israel's northern coast, attests that this building bears the mark of Phoenician construction, not likely to be found otherwise in the Judean hills. In fact, quite a bit about David's palace is known from the Bible itself. It was a "house of cedars" built by Phoenician builders (2-Samuel 5:11 and 1-Chronicles 14:1) who used the cedars of Lebanon and developed a distinct style of stone masonry. Remains of pillars and decorative stone capitals in this particular style were discovered at the site years before, which was one clue Mazar used to look for the palace. Mazar believes that the palace was used for Jewish monarchs until the destruction of the First Temple 450 years later. To indicate this, she speaks excitedly about a tiny clay item she found at the site (found on the 17th of Tammuz, the fast day commemorating the siege of Jerusalem before its destruction). It is called a "bulla," a clay disc, inscribed in ancient Hebrew script with the name of the sender as a "return address," used to seal papyrus scroll "mail." 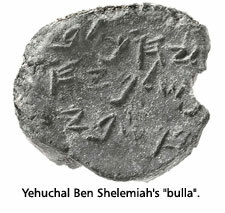 The bulla bears the name of Yehuchal Ben Shelemiah,* who is mentioned in Chapters 37 and 38 of the Book of Jeremiah. Yehuchal was one of two emissaries dispatched by King Tzidkiyahu to Jeremiah, asking him to pray for the people during the siege of Jerusalem by Nebuchadnezzar, King of Babylon. In an about-face, Chapter 38 tells that Yehuchal was one of four ministers who asked the king to kill Jeremiah, claiming that he was demoralizing the besieged nation with his prophecies of doom and destruction. The bulla found on the site of the palace indicates that the building was used by the king, or at least by his ministers, until the destruction of Jerusalem soon afterwards. (In fact, a nearby cistern uncovered in what might have been a king's courtyard is speculated to perhaps be the pit Jeremiah was lowered into, as recorded in Jeremiah 38:6). Mazar is heady, not with personal glory or the fame, but with what she considers validation of the Bible she so loves and respects. Mazar took the bulla home to examine and decipher. With the help of a needle and magnifying glass, she cleaned off the grains of dust until the ancient inscription was revealed. Together with her boys, aged 14, 13, and 11, they managed to decipher the ancient Hebrew script. Mazar's late husband, also an archaeologist, had published material on bullas, and the boys made use of their father's articles which explained how to properly examine and decipher the clay. Mazar is heady, not with personal glory or the fame that has followed her since the discovery, but with what she considers validation of the Bible she so loves and respects. "Today the scholarly approach to Tanach [the Bible] is that it's not true unless you can prove it true. Maybe we should do a little reverse. Why don't we say it's true unless we can prove otherwise?" More than ten years ago, Mazar proposed a solid thesis as to the location of the palace, and argued her position in a piece published in Biblical Archaeological Review. After years of digging in the City of David under her professional mentor Yigal Shilo before he passed away, and based on finds several decades ago by British archaeologist Kathleen Kenyon, she knew she was in the right place. David's palace was the topic of her last conversation with her famous grandfather, biblical archaeology Professor Binyamin Mazar, before he died ten years ago. He told her, "Kenyon found the protoaeolic capitals (of the decorative Phoenician stone-work), so go and find where she found them, and start there." Despite her sound hypothesis and impeccable credentials, she couldn't find any financial backers, as if no one in the academic world really wanted to find David's palace. It would just be too politically complicated. It's no wonder, when even mainstream archaeologists are inclined to play down finds which might be considered too highly charged with biblical or historical accuracy. An example is Adam Zertal, who in 1983 discovered an enormous sacrificial altar on Mount Eval, on the very mountain where Joshua was described in the Bible as having built an altar after the Jews crossed the Jordan River. The altar he found contained tools dating to the 12th century BCE, the time the Jewish people entered the Land, and its construction matched the descriptions of Joshua's altar in both biblical and rabbinic texts. But instead of the expected excitement accompanying such a monumental find, Zertal's academic colleagues ignored him and his discovery. The more vocal accused Zertal, a secular Jew raised on a kibbutz, of being politically motivated to support Jewish settlements in the area around Shechem (Nablus), where Mount Eval is located. Despite the seeming indifference from the academic world, Mazar's proposal finally found a sponsor in the Shalem Center, an academic center in Jerusalem that recently established an institute for archaeological studies, and was funded by Roger Hertog, an American Jewish investment banker who told the New York Times that he fronted the dig because he wants to encourage scientific support for the Bible as a reflection of Jewish history. David Hazony, editor-in-chief of Azure, a journal published by the Center, is excited about Mazar's results. "We don't want to see this shunted to the side like Zertal's discovery," he told Aish.com. "The message he got from his colleagues was, 'It's bad for business to find things from the Bible these days. It makes us look like unsophisticated messianic fanatics.' Unfortunately, academia has done much to undermine the Jews' capacity to say where they come from and what their past is all about. We want to create an environment where serious scholars can pursue their research without feeling intimidated." But as fast as new Jewish artifacts are being unearthed, Mazar is concerned that a great number are being destroyed. As spokesperson for the Committee Against the Desecration of Antiquities on the Temple Mount, Mazar has for the past six years tried to alert the world to the vandalism being perpetrated by the Muslim Waqf, who have their own agenda of destroying remnants of proof of Jewish sovereignty in Jerusalem, and who consistently deny that there ever was a First or Second Temple. According to agreements made between the Israeli government and the Waqf, to whom the Israelis handed control of the Temple Mount in 1967, the Arabs are not permitted to carry out independent works on the Mount without permission from the Israel Antiquities Authority. Over the years, however, there have been indications of the Waqf breaking this status quo, such as when they sealed up the ancient Hulda Gates entrance to the Temple Mount on the southern wall and buried the adjoining steps and ancient tiling, and the sealing of an underground water cistern that some rabbis thought would lead to the Temple foundations. The greatest breech was discovered in 1999, when the Waqf bulldozed and then paved over close to 6,000 square meters of the ancient Temple Mount surface. Temple Mount artifacts were ripped from the Mount and secretly dumped in several places throughout Jerusalem, mostly in the Kidron Valley east of the Old City and also in the city dump. Over 100 truckloads of Temple Mount rubble, soil and artifacts were clandestinely removed. Tzachi Zweig, then an archaeology master's student at Bar Ilan University, blew the whistle on the Waqf when he discovered Temple artifacts in junk heaps around Jerusalem, and then presented some of the artifacts he unearthed at an archaeology conference at the university. Under the supervision of his mentor, Professor Gabriel Barkay, dozens of truckloads of the "garbage" were moved to a special site near Mount Scopus, where until today teams of archaeologists and volunteers continue to find massive amounts of valuable, significant artifacts from the First and Second Temple periods. Antiquities in Israel has long been a politically contentious topic, with all its religious and nationalistic overtones. The jury is still out on where all this activity will lead. But one thing is certain: Mazar's discovery has rocked the archeological world. As Hazony wrote in Azure: "Is this absolute proof? No. But it is enough to shift the burden of proof... The normally reserved Amihai Mazar of Hebrew University, one of the most esteemed scholars in the field of biblical archaeology and author of the standard textbook, Archaeology of the Land of the Bible, 10,000-586 BCE, has described the discovery as 'something of a miracle'." "In the end," says Mazar, "the integrity of the land and its history will prevail. And I'm grateful to have a small part in it." *And Yehuchal's "business card" is actually one of several that have been discovered in the last decade, which give further testimony to the veracity of the biblical account of the king's court activities prior to Jerusalem's destruction. In another excavation site, thought to be the remains of a public building, over 50 bullas were discovered under the charred layers of destruction. King Nebuchadnezzar's fires razed the city, but those same fires solidified the clay seals like a kiln, preserving them in good condition and fully legible. They bear dozens of Hebrew names, two of them belonging to characters in the Bible who were contemporaries of Yehuchal. One of those is Gemaryahu Ben Shafan, one of King Yehoyakim's scribes, in whose chamber Baruch Ben Neria read Jeremiah's words of rebuke and repentance (Jeremiah 36:10). Another name is Azaryahu Ben Hilkiyahu, a member of the family of high priests who officiated before Jerusalem's destruction (Chronicles I, 9:10). I was a teenager with USY working at the kotel site. Why was it neccessary to pave over all of the mikvahs we unearthed? it shows to the world and Muslims that Jerusalem is in fact the Jewish State's capital since King David's reign. Friends of Israel From East Timor. Be proud to be Jewish. As in many professions theories come and go, but taken as a whole Biblical Archaeology paints a broad sweep of evidence for the veracity of the Tenach easily reaching back to the time of Avraham and perhaps even the Ark of Noach (in Turkey). As a student and teacher of history in both secular and religious schools I can attest to voluminous artifactual evidence that does not need tremendously complex interpretations to verify Biblical accounts. Many modern theories are proposed out monetary, political and personal agendas. If you read Kings and Chronicles you will notice that Solomon built the really big grand palace. Either way, it is a great find. It was David that had a palace built. And then he asked to build a temple, but God told him that it would be his son that would do it. I am delighted to see another piece of the puzzle falll into place to prove the Bible true and accurate. My heart rejoices. Israel be proud of your heritage and thankful of who you are. This is extremely well written. To share with the public the actual balance of what Elilat Mazar has found and how the archaeological world is reacting it must reflect the current situation. Eilat found another bullae from the same story on the Bible, which is incredible and advances the thrust of this article by miles. She published her 2005-2007 seasons in preliminary form last month, with further findgings, and the whole situation is different. what calendar for dating is used ? Is her dating done according to the Hebrew calendar or the secular one ? They are supposed to be off by about 150 years in ancient times. So how is she measuring finds vs. times they are supposed to be from ? Once again, the Bible proves itself to have a 100% Historical accuracy. If we have the dots of a picture we can connect them and gain the picture. Unless there is a another set of dots providing a very similar but different picture we must accept the first. It is a far greater stretch of the imagination to imagine another picture without a recorded history than the one placed before you in such fine detail as the Bible. There will always be scoffers and unbelievers and they will be the in the majority. To imagine a world without God is to imagine deadly confusion and the futility of life. I am an American Christian who had the good fortune to take a tour of Israeil with other Americans in 1989 with Ms. Mazar's father and brother leading the tour group. We visited the southern wall area Eilat had recently been given charge of where she gave us a talk about her excavations. This is so exciting to read about what has been uncovered after all these years. This is in deed an important find. My congratulations to Eilat. What patience it must take to do archeological work! God bless! Thanks to all of you for bring out the truth. I am acquainted with some of the volunteers from OK. Their feedback is very exciting. The work seems to be working smoothly and quickly. May God continue to bless and inspire Eilat Mazars work. I am very grateful for the work of Eilat Mazar. I intend to use some of the information gleaned from this article to teach an adult Bible class. I firmly believe that the closer we come to the coming of Messiah, the more archeology will uncover the truth of what ancient Jewish history proclaims. Someone once told me that archeology is actually young and compared to the ground it has to cover, no one can say something is histortically untrue. Can we prove, unquestionably, that Dante wrote the works that are attributed to him...or that some of the world's greatest art was truly the work of its acclaimed artists?? No..we only have the WORDS of those who SAY so!! This is a really well written and information rich article. It could be the basis of an incredible documentary and book! Having recently toured Israel, I find any new information showing how accurate the Bible is so very exciting! One thing about this article really stood out to me: We need to not be so afraid of our heritage as Jews, and reclaim what is rightfully ours. And somebody please tell me why the Waqf still has control over the Temple Mount. Especially when we know they are trying to destroy our history. Enough rambling... Great article, keep it up! Methinks there must be something of the divine in all this---the well-perserved, shallowness of the find, the easily-decoded bullae, even Ms. Mazar's husband's work on the tablets. God can be slow but He's usually working on something. God bless! Thank you for sending me the updates. I enjoy them very much. The archaeological evidence is overwhelming, yet people who don`t want to believe wont believe, even though they believe anything and everything else, evolution, big bang, dinosaurs and the trillion zeros they add after the number one. Encouraging proof of what we know is true. I'm always so excited to see your byline; you consistently write about topics that are so important and dear to my heart. Now that I don't see you anymore (it's been a long time since Seminary!) I feel connected to you by your powerful words. the discovery just goes on to confirm 4us believers the wonderful truth and beauty we have found in the Bible. we are not shaken by the unbelievers' qualms. I love this article, thank you for publishing it. I took an elective course in college just prior to entering the Canadian military on the ancient biblical scrolls, and some of the articles by the revisionist "scholars" such as Keith Whitelam were forced down my unwilling throat. 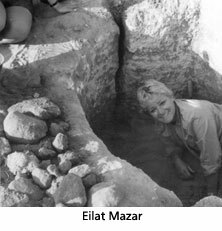 This wonderful article by Rachel Ginzberg on the work of Dr. Eliat Mazar which verifes so much of the biblical account is most refreshing. After reading this article I finally have an inkling as to why there is a dearth of excavations confirming the veracity of the Torah. It always disturbed me and now I understand the reason. What a pathetic state the Jewish people are in; but on the other hand - look at what Hashem is now revealing to us! There is hope - this is part of the heraldry of Mashiach. Yishar Koach to my friend Rachel - what a fabulous article to give us all Chizuk and what a Zchus to help spread the news! Thank you Aish and thanks to Prof. Mazar! Ms. Mazar is to be thanked for her perseverance in searching for this most important structure. We will be awaiting much in-depth information from her about this find! The first time I was in Israel (six years ago.) I was told by a very wise tour guide that, "the present is fixed and the past is always changing." he concluded with information on archeology and how new sites are discovered and how they then change our perception of the past. Best wishes to the archeologist of this story, it is truly remakrable to see what science has to say about the ancient world. It is of some good importance that archaelogy is able to show evidence to all, of ancient Jewish heritage and ties to the land of Israel, esp in these present times. The article on David's palace is quite remarkable. What can be done to get world opinion behind an honest accounting of the degradations of Jewish antiquities? I love your web site. I don't doubt your findings for one second. Keep up the good work. We have only the proofs that we deserve as jewish people. Keep the faith of our forfathers. Thank you for the excellent article detailing the amazing discovery of King David's palace in Jerusalem. I immediately read every word. This well written piece gave pertinent background, interesting details surrounding the case, and compelling information as to the ramifications for biblical archaeology in general. Israel and all who love her can be proud of Eilat Mazar!!! so much for the minimalist view.Keep the truth coming. This is wonderful news and it makes me proud to be living in the day and time of the finding of King David's palace. Absolutely phenomenal. I love Biblical archaeology. I am absolutely proud that Dr. Mazar has this find. a discovery absolutely unique and vastly underpublicized. Thank you Rachel Ginsberg for providing us with such good news. Your article was very informative and enjoyable to read. This discovery is tremendously exciting! I minored in archaeology and have dabbled in it for the last 30 years. I can honestly say this article has excited me more than almost anything else in the world of antiquities in all that time. I remember coming to Israel in 1969 and suddenly the Bible changed from a storybook to a history book. How much more so now should we be in awe that... it is real! This is the first mention I have seen of this find. Kudos to Aish.com - what a phenomenal website! Clearly this story is not being told by the general news media with any enthusiasm. As Rachel Ginsberg points out, it doesn't fit with their agenda, which is to promote “Palestine” and "demote" Jewish historical attachment to the land. In this they closely resemble the Philistines of old, who wanted to “get” King David before he could solidify his hold on the kingdom. What a wonderful article. It gives hope even with all the lies from the Wagf and others. Now lets forward this article to all our friends so it will get around. The media is not helping us so what are we waiting for ? I loved this article. Living in Jerusalem's Old City, a ten-minute walk from the site described in the article, I see archeological "proofs" of the Biblical narrative every time I go to the grocery store. The efforts of the anti-religious academia and media to cover up the truth is akin to their efforts to cover up the greater truth of G-d's existence. In the end, the truth will prevail. What great news. The article was well written and to the point. Dr. Mazar has done what most of us only dream of. Keep it up. We need more careful scholars that believe the Hebrew Bible accounts as accurate especially knowing that so many of the current "sites" were designated by Constantine's mother Helena in the 4th century. How accurate could she have possibly been. I believe we are in for even greater discoveries in the future that authenticate the Hebrew Text. This is an incredible article. "The jury is still out on where all this activity will lead"...let's pray and cry that this is the begining of a new begining.May the darkness that surrounds the world and especially the Jewish people soon be banished with the rising of a brilliant sun, the start of a new day. "A new light will yet shine on Zion." This is great news. I have always been concerned with the destruction of ancient Israeli archealogical remains, it's a good thing she found this one before others proceeded to destroy it. I am very impressed by the recent discoveries, especially of King David's Palace.I am slso horrified by the way the Waqf has destroyed so many thkings relating to the 1st. and 2nd. Temple. Who are we going to sell this site to or give it away? We do so well at being against ourselves that giving away precious land, holy sites etc. becomes second nature to us, and then we cry everyone is against us, maybe we should sometimes look in our own backyards for our enemies. Excellent article - Despite the political opposition it needs world wide disemination. This find opens up the possibility of further excavations revealing the truth of the biblical records. A truth the Arabs do not want to admit. The academics by and large are anti-God and anti-Biblical records. Let them weep.